Ever wonder how well you would do as a referee? Want to brush up on your knowledge of the rules? Take these practice quizzes to prepare for your annual Membership Recertification Clinic, or to just test your rules knowledge throughout the season. The BASIC quiz contains questions suitable for officials with less than five years experiences, while the ADVANCED quiz is suitable for officials who have 5+ years experience, or are Level 3 or higher. Note: You can attempt either quiz no matter what your experience or HCOP Level. These quizzes are for practice and do not count towards any Referee certification. New questions are being added regularly. When a test is submitted, you will be provided with a final score and correct answers will be given for each question. Interested in becoming an on-ice official? 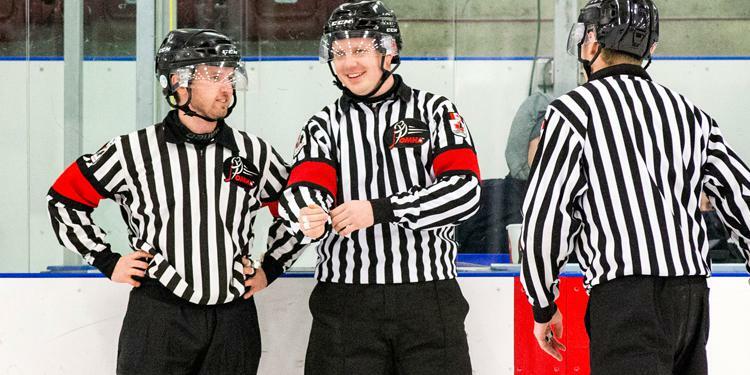 Check out the OMHA Referee page for more information. There are a number of basic quizzes you can take. Each feature a variety of different questions. These are the questions for more advanced officials.